Realme recently released the ColorOS 5.2.1 update for the Realme C1. ColorOS 5.2.1 comes with new features to improve the efficiency of the Realme C1. It now comes with the Smart Bar to allow users launch apps faster and easier. We'd like our customers to know that similar to other higher-tier smartphones, the Realme C1 can keep up with the latest trends through updates being rolled out in the market. Built to last, the Realme C1 is designed to be future-proof so as to welcome new and better features such as the updates to the ColorOS. Our smartphones are ready to offer powerful performance for a long period of time, shares Realme Philippines Chief Operating Officer Jacky Chen. The update also highlights that it allows quicker launch of Google Assistant with 0.5-second press of the power button. ColorOS 5.2.1 also features an updated Android Security Patch for a much more secure mobile experience. Realme also optimized the Reminders features. It is an update that can be used once Developer Options, Accessibility Mode and Device Manager are turned on. The emerging mobile brand also improved the touchscreen fluency to ease smartphone interaction. There's an added reboot function, single swipe notification dismissal and headset icon in the status bar. 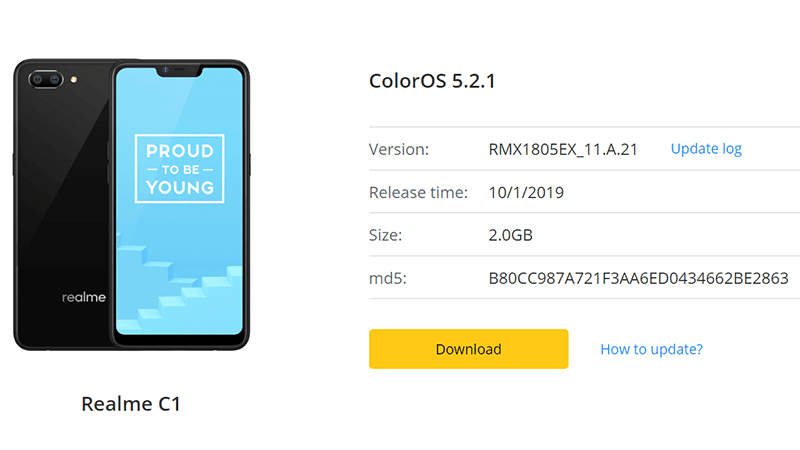 To update your Realme C1 to ColorOS 5.2.1, visit this link. To read our Realme C1 full review, click here.